In a loan, one party is the borrower and the other is the lender. Mechanically, it is very simple. The lender gives the borrower money and the borrower agrees to pay interest on the outstanding balance and to repay the principle. As with many principles in economics, one can shed light on a trade by looking back in history to a time before the trade existed and considering how the trade developed. THE EUROPEAN DEBT BUBBLE HAS BURST, AND THE REPRICING OF RISK AND DEBT CANNOT BE PUT BACK INTO THE BOTTLE. It’s really this simple, Europe: either rebel against the banks or accept decades of debt-serfdom. All the millions of words published about the European debt crisis can be distilled down a handful of simple dynamics. Once we understand those, then the choice between resistance and debt-serfdom is revealed as the only choice: the rest of the “options” are illusory. The euro enabled a short-lived but extremely attractive fantasy: the more productive northern EU economies could mint profits in two ways: A) sell their goods and services to their less productive southern neighbors in quantity because these neighbors were now able to borrow vast sums of money at low (i.e. near-“German”) rates of interest, and B) loan these consumer nations these vast sums of money with stupendous leverage, i.e. 1 euro in capital supports 26 euros of lending/debt. This explains at least part of the German export and manufacturing miracle of the last 12 years. In 1999, exports were 29% of German gross domestic product. By 2008, they were 47%—an increase vastly larger than in Italy, Spain and Greece, where the ratios increased modestly or even fell. Germany’s net export contribution to GDP (exports minus imports as a share of the economy) rose by nearly a factor of eight. Unlike almost every other high-income country, where manufacturing’s share of the economy fell significantly, in Germany it actually rose as the price of German goods grew more and more attractive compared to those of other countries. In a key sense, Germany’s currency has been to Southern Europe what China’s has been to the U.S. Flush with profits from exports and loans, Germany and its mercantilist (exporting nations) also ramped up their own borrowing – why not, when growth was so strong? In simple terms, this is the stark reality: now that debt and risk have been repriced, Europe’s debts are completely, totally unpayable. 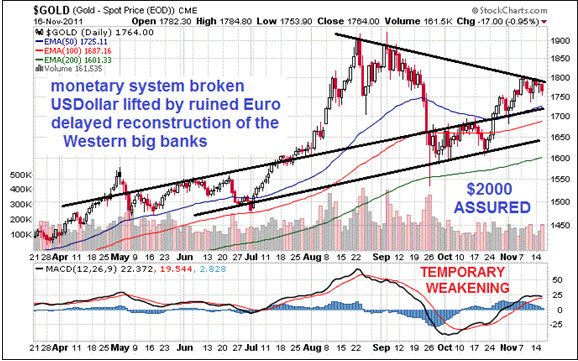 There is no way to keep adding to the Matterhorn of debt at the old cheap rate of interest, and there is no way to roll over the trillions of euros in debt that are coming due at the old near-zero rates. Three metaphors describe Europe: drowning in debt, circular firing squad and trying to fool the money gods with an inept game of 3-card monte. 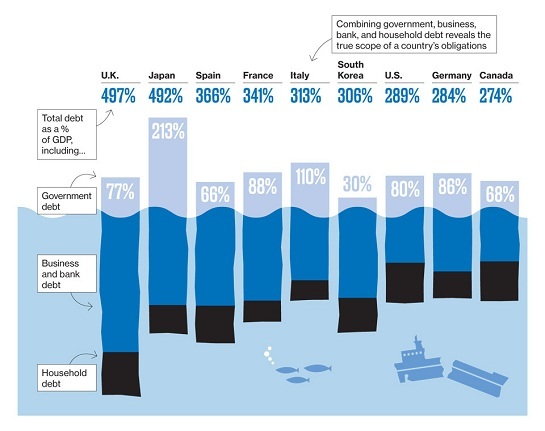 The world’s major economies are drowning in debt – Europe, the U.S., Japan, China. We all know the U.S. has tried to save its drowning economy by bailing out the parasite which is dragging it to Davy Jones Locker–the banking/financial sector– and by borrowing and squandering $6 trillion in new Federal debt and buying toxic debt with $2 trillion whisked into existence on the Federal Reserve’s balance sheet. It has failed, of course, and the economy is once again slipping beneath the waves while Ben Bernanke and the politico lackeys join in a Keynesian-monetary cargo-cult chant: Humba-humba, bunga-bunga. Their hubris doesn’t allow them to confess their magic has failed, and rather than let their power be wrenched away, they will let the flailing U.S. economy drown. Germany, the mighty engine which is supposed to pull the $16 trillion drowning European economy out of the water, is as indebted as the flailing U.S. Second, the euro’s handlers have already sunk staggering sums into hopelessly insolvent debtor nations, for example, Greece, which has 355 billion euros of outstanding sovereign debt and an economy with a GDP around 200 billion euros (though it’s contracting so rapidly nobody can even guess the actual size). According to BusinessWeek, the E.U. 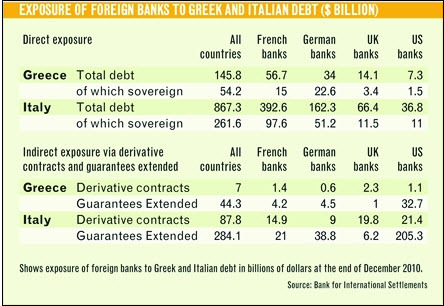 (European Union), the ECB (European Central Bank) and the IMF (International Monetary Fund) own about $127 billion of this debt. In other words, they have not just put on concrete boots, they’ve laced them up and tied a big knot. We cannot possibly drown, they proclaim; we are too big, too heavy, too powerful. We refuse to accept that all these trillions of euros in debt are now worth a pittance of their face value. When you’re drowning in debt, the only solution is to write off the debt and drain the pool. The problem is, of course, that all this impaired debt is somebody else’s asset, and that somebody is either rich and powerful or politically powerful, for example, a union pension fund. Third, the euro’s handlers have set up a circular firing squad. Since the entire banking sector is insolvent, the handlers are demanding that banks raise capital. Since only the ECB is insane enough to put good money after bad, the banks cannot raise capital on the private market, so their only way to raise cash is to sell assets–such as rapidly depreciating sovereign-debt bonds. This pushes the price of those bonds even lower, as supply (sellers) completely overwhelm demand from buyers (the unflinching ECB and its proxies). This decline in bond prices further lowers the value of the banks’ assets, which means they need to raise more capital, which means they have to sell even more bonds. Voila, a circular firing squad, where the “bulletproof” ECB is left as the only buyer who will hold depreciating bonds longer than a few hours, and all the participants gain by selling bonds before they fall any further. This is the classic positive feedback loop, where selling lowers the value of remaining assets and that drives further selling. EXTREME POVERTY IS NOW AT RECORD LEVELS. Here are nineteen statistics about the poor that will absolutely astound you. The extreme the wealth disparity in the U.S. keeps on widening. We already know that people at the higher percentage levels are doing well, particularly at the highest, while the middle class is shrinking rapidly. According to the U.S. Census Bureau, a higher percentage of Americans is living in extreme poverty than they have ever measured before. In 2010, we were told that the economy was recovering, but the truth is that the number of the “very poor” soared to heights never seen previously. Back in 1993 and back in 2009, the rate of extreme poverty was just over 6 percent, and that represented the worst numbers on record. But in 2010, the rate of extreme poverty hit a whopping 6.7 percent. That means that one out of every 15 Americans is now considered to be “very poor”. For many people, this is all very confusing because their guts are telling them that things are getting worse and yet the mainstream media keeps telling them that everything is just fine. Hopefully this article will help people realize that the plight of the poorest of the poor continues to deteriorate all across the United States. In addition, hopefully this article will inspire many of you to lend a hand to those that are truly in need. About 20.5 million Americans, or 6.7 percent of the U.S. population, make up the poorest poor, defined as those at 50 per cent or less of the official poverty level. Those living in deep poverty represent nearly half of the 46.2 million people scraping by below the poverty line. In 2010, the poorest poor meant an income of $5,570 or less for an individual and $11,157 for a family of four. 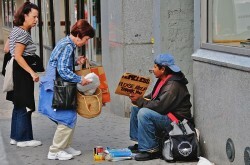 According to a recent Bloomberg article, the “very poor” are increasingly being pushed into these “bad neighborhoods”. At least 2.2 million more Americans, a 33 percent jump since 2000, live in neighborhoods where the poverty rate is 40 percent or higher, according to a study released today by the Washington-based Brookings Institution. Of course they don’t have much of a choice. They can’t afford to live where most of the rest of us do. But today we are losing out on a massive amount of wealth. We have tens of millions of people that are sitting at home on their couches. Instead of creating something of economic value, the rest of us have to support them financially. That is not what any of us should want. It is absolutely imperative that we get as many Americans back to work as possible. The more people that are doing something economically productive, the more wealth there will be for all of us. That is why it is so alarming that the ranks of the “very poor” are increasing so dramatically. When the number of poor people goes up, the entire society suffers. So just how bad are things right now? The following are 19 statistics about the poor that will absolutely astound you…. This is a must-see! The European Stability Mechanism (ESM) accord is scheduled to replace the EFSF. The following video highlights the key sections of the proposed treaty. This is a horror story, folks! Article 27 says ESM shall enjoy “immunity from every form of judicial process”. Thus the ESM can sue member countries but no one can challenge it. No governments, parliament or any other body or laws apply to the ESM or its organization. There are no independent reviewers and no existing laws apply. Thus Europe’s national budgets will be in the hands of one single, unelected body that is accountable to no one and immune from all legal actions. Is this the future of the EU or will the German supreme court and other governments put an end to it?